From its inception, Stevens has very deliberately identified and pursued research and education in areas of true societal need, from the Industrial Age to the Information Age. With this focus, Stevens has left its mark on the world over its nearly 150-year history. As the 21st century unfolds, Stevens will build on this record to become a global leader in targeted domains that draw upon the unique strengths and scholarly interests of our faculty and researchers. As society’s needs evolve, so will our emphasis and our focus, guided by our core values and principles. The areas upon which we will build—our “foundational pillars”—represent research and education domains in which we possess both existing expertise and a strategic focus for the future. The foundational pillars are envisioned as inter- and multi-disciplinary domains that will engage diverse collaborators, internal and external to Stevens, in dynamic partnerships and communities in the pursuit of large-scale grant funding and the creation of centers of excellence and practice. 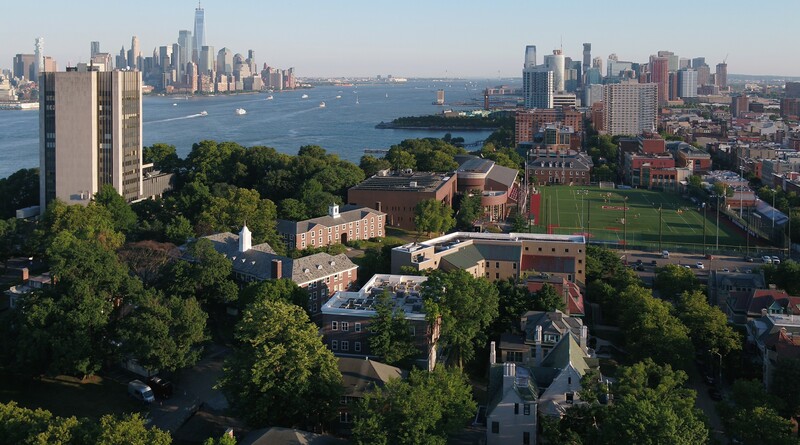 Through interdisciplinary research collaborations and innovative educational programs, as well as external partnerships, Stevens will maximize our societal impact and build our reputation in strategically selected target areas. In parallel, we will continue to focus on the hallmark features of a Stevens education that have distinguished the University over generations of students and prepared Stevens alumni for leadership positions in industry, as entrepreneurs, innovators, and academics, and in a wide variety of careers: a rigorous, broad-based, technology-infused curriculum spanning engineering, the sciences, and business as well as the humanities and social sciences; a methodical and quantitative approach to problem-solving; an underlying and pervasive emphasis on design, innovation and entrepreneurship; and experiential learning opportunities, including career-focused and perspective-broadening opportunities such as co-operative education, internships, international experiences, and service learning. These are some of the integral and distinctive aspects of a Stevens education. Artificial intelligence (AI) is at the core of many of the emerging technologies that will transform daily life. Machines can now mimic sophisticated functions of the human mind, advancing the cognitive processes that allow them to “learn” without being programmed, an approach known as Machine Learning (ML). ML is what enables driverless cars to plan safe routes, translates vast amounts of health-related data into better medical care, and underpins product recommendations, digital personal assistants, new financial systems, online advertising, and more. Stevens will build capacity in AI/ML research in order to innovate and transform large-scale data sets into actionable knowledge. In addition to the new and emerging opportunities created by the proliferation of data by individuals, corporations, and governments, new challenges are also created in the form of cyber threats to networks, information systems, and infrastructures. Stevens’ strengths in cybersecurity— reaching from mathematical foundations, formal methods, privacy, network and systems security, and cybersecurity in critical infrastructure, to application areas such as finance and maritime transportation systems— will be leveraged to develop the tools and methods to confront increasingly sophisticated and damaging cyberattacks and address projected shortages in the cybersecurity workforce. Stevens will also advance this pillar with a vision for educational programs that equip students with strong computational foundations. The use of data in product design, marketing, and operations is reshaping the modern world. For example, projections by Gartner, Inc., indicate that in less than 12 months, 4.4 million information technology jobs will be created globally, of which 1.9 million will be in the United States. Estimates indicate that the amount of data generated over the last two years is greater than that in the previous history of the human race, with exponential growth projected for the future. More importantly, over the past decade, the value of data has increased at least as fast due to new technology, applications, and products created to understand data in order to support decision making. At Stevens, data science and information systems will be applied to measurement devices, communications networks, data management and analytics, visualization, and user access domains. Multidisciplinary teams of data engineers, computer scientists, domain experts, and statisticians will turn corporate data into knowledge that leads to smart operations and intelligent business decisions. Stevens will fuel progress through novel research in areas such as the confluence of ever-increasing network speeds and higher rates of sensor output from the Internet of Things (IoT), and will contribute to advances in visualization, machine learning, and metaheuristic optimization. Complex systems, such as healthcare delivery, transportation, and urban infrastructure, are laced with behavioral and social phenomena; values, norms, precedents, and vested interests. Complexity in these systems compromises the ability to predict their behaviors, and to establish the causality of such behaviors. Stevens is committed to playing a leadership role in developing increased understanding of these complex systems, improving their operations, and adding to the value delivered to their constituencies. The performance, safety, security, and economics of such systems involve the interplay between humans and machines, including the ability to foster learning systems. Stevens will use models, simulations, and interactive visualizations to construct policy simulators that enable key stakeholders to explore the complexity of their domains, assess the consequences of various scenarios, and work with multi-disciplinary teams to analyze systemic policies, evaluate underlying assumptions, entertain alternative decisions, and reach well-informed conclusions. Finance was once an industry that operated through interpersonal exchanges, but has evolved into a fundamentally technology-based industry. The field now demands a sophisticated workforce with interdisciplinary expertise across technology, engineering, mathematics, and computer science. Stevens will approach this “new model of finance” by supporting multiple laboratories for financial systems, developing strategic partnerships with key industry constituents, such as First Derivatives and Goldman Sachs, and creating the node for a quantum computing and communications network for financial applications, analytics, and visualization. Excelling in thought leadership, researchers in the Hanlon Financial Systems Center will continue to make seminal contributions to financial cybersecurity, Fintech, and venture capital, as well as high frequency data in finance. With the merger of Stevens’ financial engineering programs into the School of Business, the University will increase and develop its finance footprint to be at the forefront of the needs of and solutions for the contemporary financial industry. The healthcare industry accounts for 18 percent of the nation’s Gross Domestic Product and continues to grow. Stevens’ Center for Healthcare Innovation (CHI) will lead in this area and will contribute significantly to the pharmaceutical and biotechnology industries, clinical research organizations, medical centers, and start-up companies, as well as to healthcare policy, delivery, and management. The University’s interdisciplinary approach will capitalize on innovative content in biology, chemistry, engineering, computer science, healthcare management, pharmaceutical manufacturing, business and ethics, and leverage nano- and micro-scale technologies as innovative enablers for transformative societal impact. CHI will develop technologies and processes to address major areas of unmet medical need in domains ranging from tissue engineering, biomaterials, biosensors, drug discovery, healthcare analytics, and healthcare delivery and will form a unique academic-industry-government enterprise to become a national leader in translational biomedical innovation. Drug discovery research will include the development of cancer drugs and emerging therapies for traumatic lung injury. Innovations in tissue engineering will advance patient-specific disease models for multiple myeloma, breast and prostate cancer, osteoporosis, and graft versus host disease and include developments in surgical instruments, physiological sensors, remote monitoring, and advanced data analytical tools. The resilience and sustainability challenges of the future demand the redesign and re-engineering of urban environments, particularly in coastal locations that are increasingly vulnerable to sea-level rise. A changing climate will lead to more intense and perhaps more frequent storm events, with larger surges and damaging flooding. The ability to forecast and communicate these imminent risks with a high degree of accuracy will play a pivotal role in ensuring that coastal communities will prosper into the future. Stevens’ research in resilience and sustainability will respond to the critical need for adaptive science and practice-relevant knowledge in this area. Stevens will advance its unique, combined expertise in multi‐scale geophysical fluid flow and biogeochemical fate and transport modeling of legacy and emerging contaminants, science‐based parameterization, and data-intensive computing that is well suited to coastal urban ocean engineering. Developing strategies and techniques for sustainability, Stevens will build new programs that meet a range of human needs such as protecting environmental quality, reducing human health risk from exposure to environmental contaminants, and balancing environmental protection with societal benefits and economic growth.